Buzby - Make Someone Happy ! In the mid 1970s the General Post Office (GPO) was concerned that following two telephone tariff increases, the public now perceived that using the telephone was expensive. If left unchecked, this would not only deter existing customers from using their phones but also limit the number of new subscribers that could be recruited. In early 1976 a television publicity campaign featured a 10p coin rolling across the screen to show how much you could get for your money during the cheap rate period. As a follow up a new advertising campaign was launched in May 1976 featuring a yellow cartoon bird; Buzby had been hatched! Buzby was normally featured perched on telephone wires and initially encouraged us to Make someone happy with a cheap rate phone call. However, this was changed to the more familiar Make someone happy with a phone call. The telephone would now be marketed, not on the price as such, but on the positive social impact that using the phone has on our family and friends. 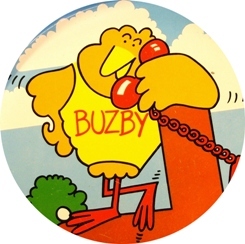 Buzby was often featured for example, calling his mother. The well known actor Bernard Cribbins (voice of The Wombles, Jackanory presenter, Mr Perks in the Railway Children film, Carry On film star and Donna Noble’s granddad in Dr Who) provided the voice of Buzby. Buzby’s mother was played by the British comedy actress Irene Handl. In addition to the television adverts, Buzby featured on telephone bills, the sides of GPO vans, posters, children’s games and books, mugs, badges and even on an illuminated sign in Piccadilly Circus, London. 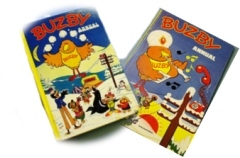 You can read more about Buzby in the article How Buzby was hatched by Mr R M Stanley published in volume 29, issue number 2 of the Post Office Telecommunications Journal (Summer 1977). Buzby was the first in a whole series of memorable television adverts promoting the telephone. Who can forget Maureen Lipman as Beattie proclaiming He gets an ology and he says he’s failed when her grandson Anthony telephones her to say that he has failed all of his exams except for pottery and sociology. You get an ology and you’re a scientist! The slogan It’s for you followed in adverts such as one featuring general Custer receiving a phone call that interrupts the Battle of Little Bighorn to tell him that reinforcements are on their way and they’ll be here – tomorrow! Bob Hoskins would later tell us That it’s good to talk and even ET the extra-Terrestrial would encourage us to Stay in touch in a series of lavish adverts based on the Hollywood film. 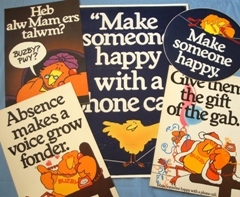 The Buzby campaign was the catalyst for all that followed and it spawned a plethora of promotional items and memorabilia. The following sections feature our collection of Buzby items and show the sheer scale and extent to which Buzby permeated virtually every aspect of life. The Buzby collection . .
A large selection of Buzby badge designs were produced ranging from circular pin badges to plastic cut outs and even a range that were clearly anti-Buzby! Click here to see our range of Buzby badges. Buzby featured on a large range of posters that appeared on bill boards and the sides of British Telecom vehicles. In our range you will see Buzby celebrating Christmas, talking to his sweat heart and even conversing in Welsh. Click here to see our range of Buzby posters. You couldn't even escape Buzby at home. Have a look at a beautiful metal Buzby tray, a set of nice Buzby mugs, coasters and paper plates. Click here to see our range of Buzby household items. Buzby had his own children's annual and also featured in a range of story books. Click here to see our range of Buzby annuals and books. Money boxes were produced in both china and metal moulded into the shape of Buzby or featuring Buzby in a telephone kiosk for example. These encouraged us to save money so that we could pay for our telephone calls. Click here to see our range of Buzby money boxes. Buzby also featured on message pads, keyrings, pencil rubbers, paper hats and clip boards. There was even a wind up Buzby toy that walked. Click here to see our range of Buzby novelties. 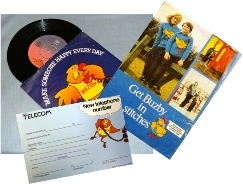 The voice of Buzby, Mr Bernard Cribbins, recorded a record single featuring two songs, Make someone happy and Buzby There was even a knitting pattern so that you could have your very own Buzby jumper to wear! Click here to see our range of Buzby miscellany.